Scientists Sicken Mosquitoes To Stop Dengue : Shots - Health News Scientists infected hundreds of thousands of mosquitoes with a mild strain of a bacterium. They believe that once mosquitoes are sick from the infection, they can't spread the dengue virus to humans. Scientists in Australia are using a bacterium to try to stop a deadly virus in its tracks. 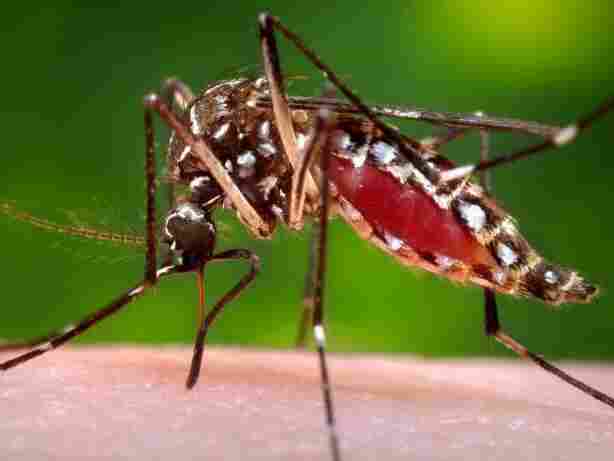 The dengue virus causes a potentially fatal flu-like illness. The World Health Organization says the number of cases of dengue around the world is skyrocketing, and the disease is endemic in more than 100 countries. It has even shown up in Florida recently. There's no vaccine against the virus yet, so control efforts have focused on the mosquito that transmits the disease. About six years ago, Scott O'Neill of Monash University had an idea about using bacteria called Wolbachia to prevent dengue's spread. The idea works like this: Use a strain of Wolbachia to shorten the mosquito's life, killing it before it becomes mature enough to transmit the dengue virus. It was a good idea, but it didn't work because the infection didn't spread to enough mosquitoes. But then O'Neill discovered something surprising. There are many strains of Wolbachia. Some do bad things to mosquitoes, such as shortening their lives, while others give them nothing more than the mosquito equivalent of the sniffles. Mosquitoes infected with any of these strains couldn't spread dengue. With a mild infection, the mosquitoes would live long enough to spread the Wolbachia around, but not the dengue. O'Neill infected hundreds of thousands of mosquitoes with a mild strain of Wolbachia in the lab, and released them in two small communities in Northern Queensland near Cairnes, Yorky's Knob and Gordonvale. This time, success: Close to 100 percent of the mosquitoes got infected, which O'Neill says he thinks "greatly reduced ability to transmit dengue between people." These results appear this week in the journal Nature. There's very little dengue in Australia, so O'Neill is planning releases in Vietnam, Indonesia and Brazil, countries where the disease is more prevalent. The bacteria could prevent dengue transmission down the line, and negate the use for dangerous pesticides, but there's always the law of unintended consequences. O'Neill says he thinks there won't be any negative ones, since there are a lot of insect species that are naturally infected with Wolbachia. He says regulatory authorities in Australia are convinced his plans are safe. It would be a kind of poetic justice if a bacterial infection in mosquitoes could prevent a viral or parasitic disease in people.